Chopin melodies used as a basis for jazz improvisation? In the wrong hands, the results could be truly catastrophic. 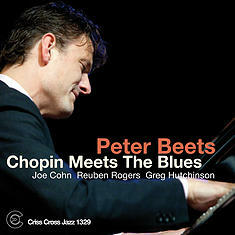 Yet it’s a notion with great appeal for celebrated Dutch piano marvel Peter Beets. It’s a happy coincidence that the fifth Criss Cross CD under Beets’ leadership arrives during the bicentennial year of Chopin’s birth. But it’s clearly not a project haphazardly thrown together at the last moment. Instead, Peter recruited three of New York’s premier jazzmen – guitarist Joe Cohn, bassist Reuben Rogers and drummer Greg Hutchinson – as co-conspirators. Together, this quartet wrings extraordinary measures of beauty, excitement and yes, fun from eight of Chopin’s most memorable pieces. Their collaboration is, in a word, breathtaking.